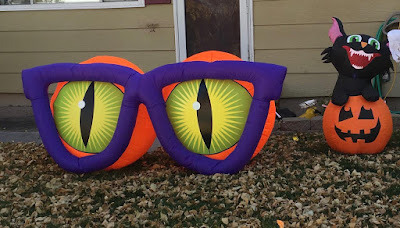 Large inflatable decorations are gaining popularity and can be seen in my neighborhood for nearly every holiday. This display was fun: the dragon's wings moved from front to back. 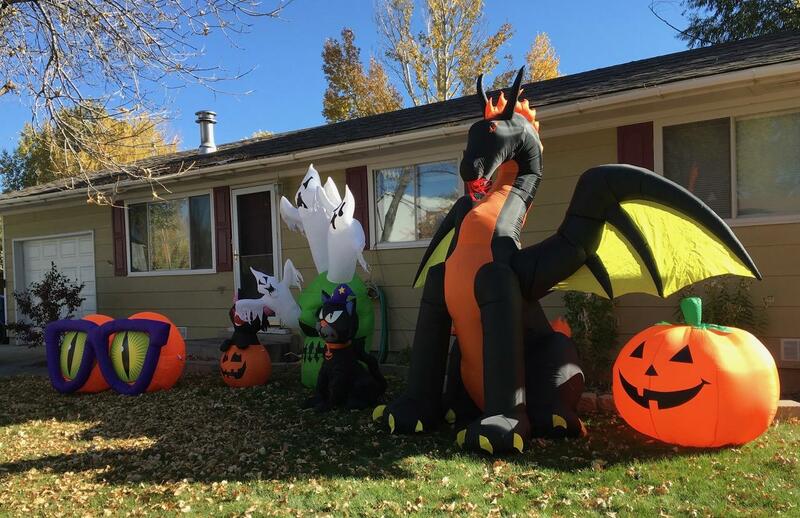 Some people only inflate the decorations at night, but in my opinion, the crumpled heaps look pretty pathetic during the day. Are inflatable, holiday decorations popular in your area? 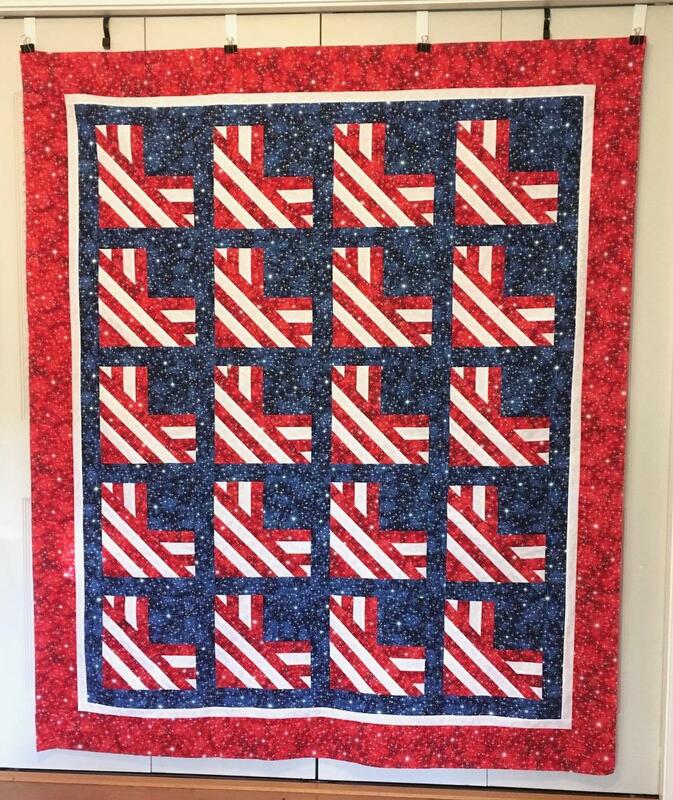 The components of this Quilt of Valor came to me from Pat S. in Virginia in mid-October. 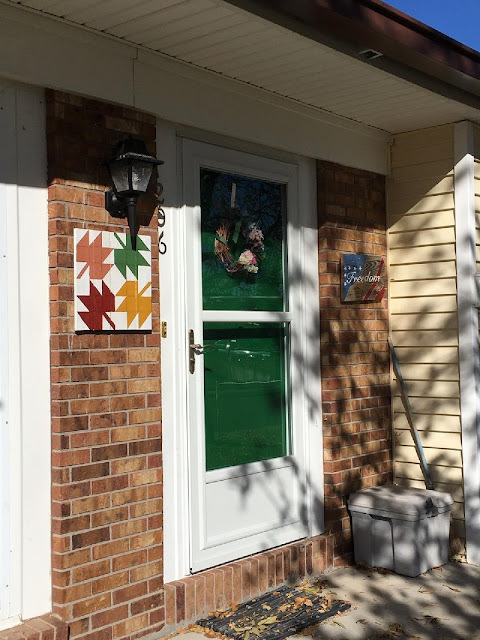 Pat constructed all the blocks (paper-pieced) and for some reason the project stalled. She asked if I would be willing to accept her unfinished project (UFO). The paper foundation for the blocks was very thick (almost the weight of interfacing), and I suspect that was the why the project became a UFO. 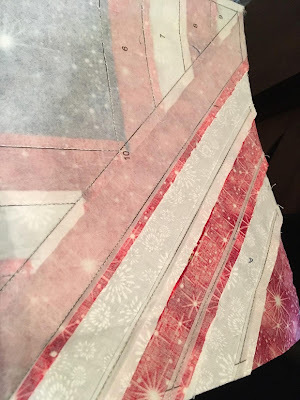 I knew the longarm volunteer would have difficulty with the thickness of the blocks, so I pondered the situation for a few days. I tried dissolving the paper without any luck. 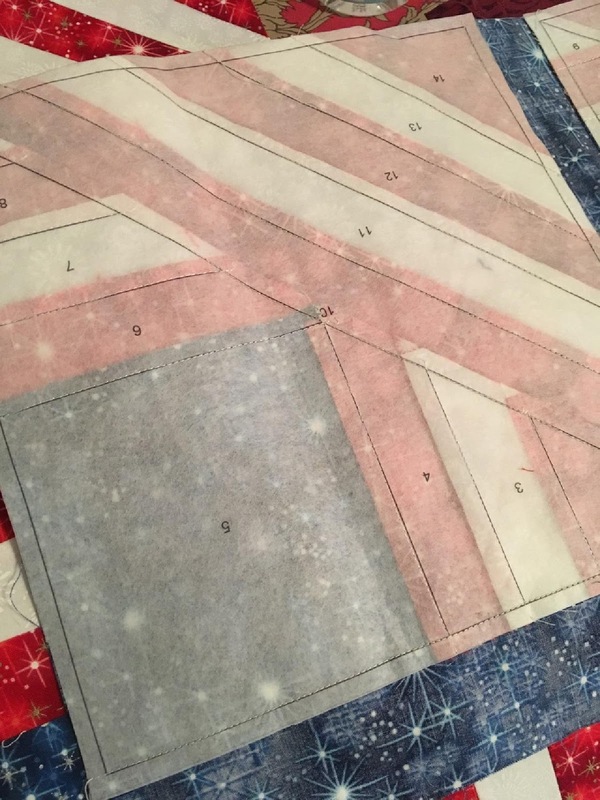 The only solution I could think of was to trim the paper close to the sewing lines. 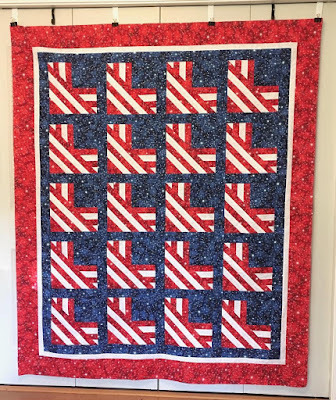 I was relieved that I finished trimming all the blocks without nicking the fabric or snipping the sewing. Once the bulk of the paper was off of the blocks, the quilt top came together easily and quickly. Thank you, Pat for allowing me to turn your UFO into a Quilt of Valor. I often pass this adorable playhouse on my neighborhood walks, and it pulls me back to my childhood dream of having my own playhouse. How I would have loved this little house and would have spent countless hours in and around it. 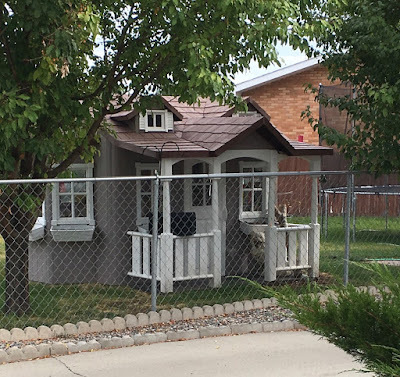 Did you have a playhouse or a favorite place in your yard to play? 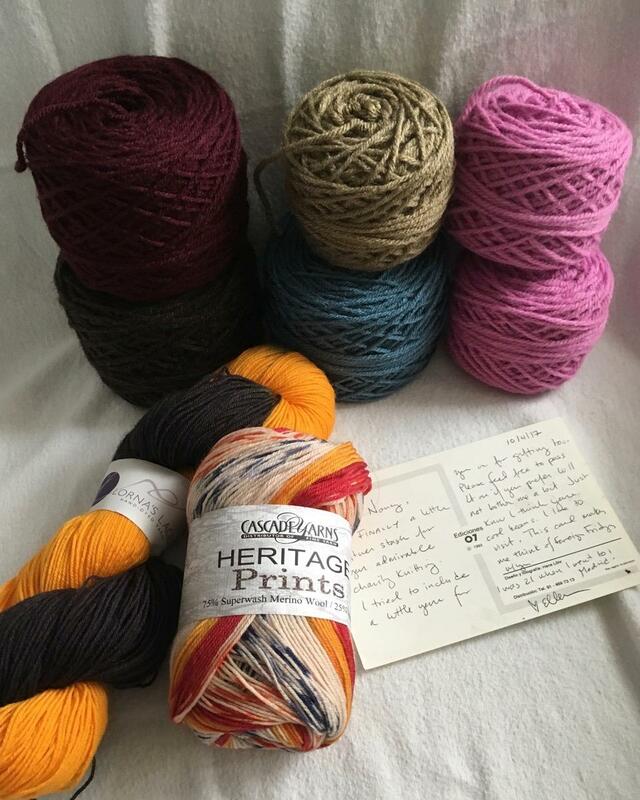 Ellen (The Ellen Report) sent me a surprise package filled with yarn. 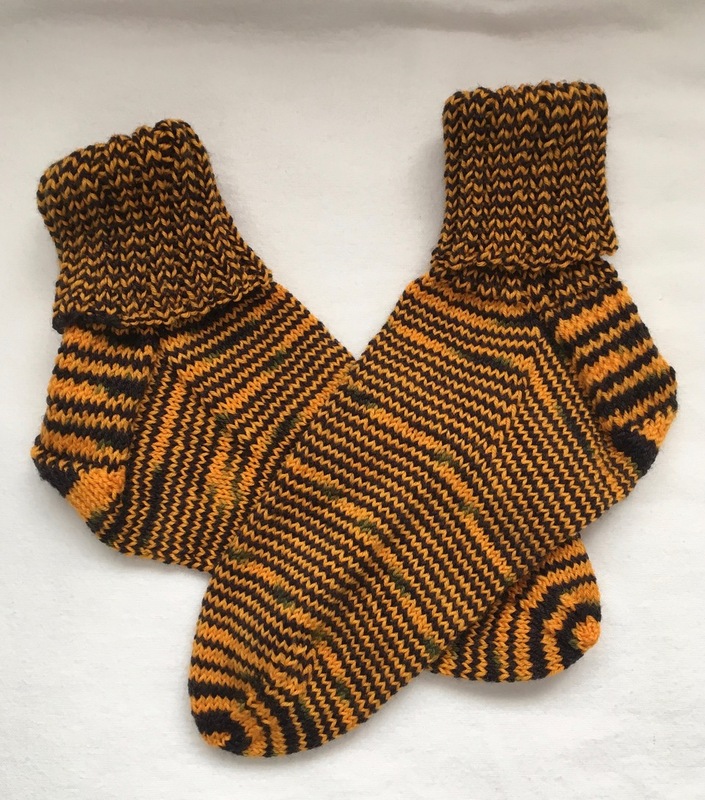 I knew immediately that the brown and gold yarn would soon become a pair of socks. 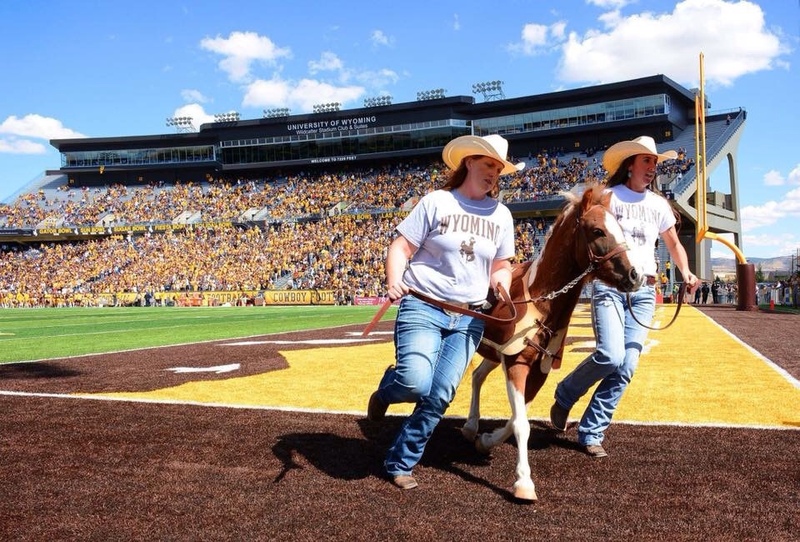 I'm a University of Wyoming alum, and the bold brown and gold yarn was pleading to become Cowboy Joe socks. I often caught myself humming the popular UW fight song as I knit. 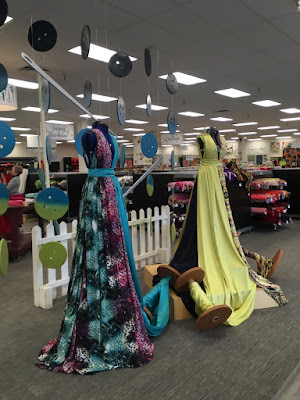 "He always sings raggy music to his cattle as he swings back and forward in his saddle on a horse . . ."
Marilyn and I stopped at Colorado Fabrics and browsed the store. 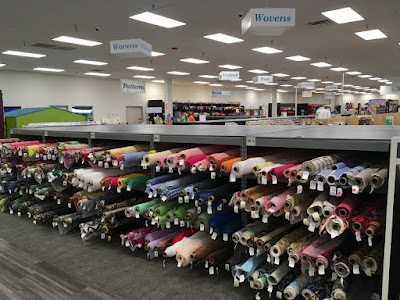 The building is huge, and the store is well stocked with luscious fabrics - wool, cotton, knit, woven, drapery, upholstery, brocade, tulle, satin, and much more. I loved all the wool inside the front door and spent a few minutes admiring the colors and patterns. 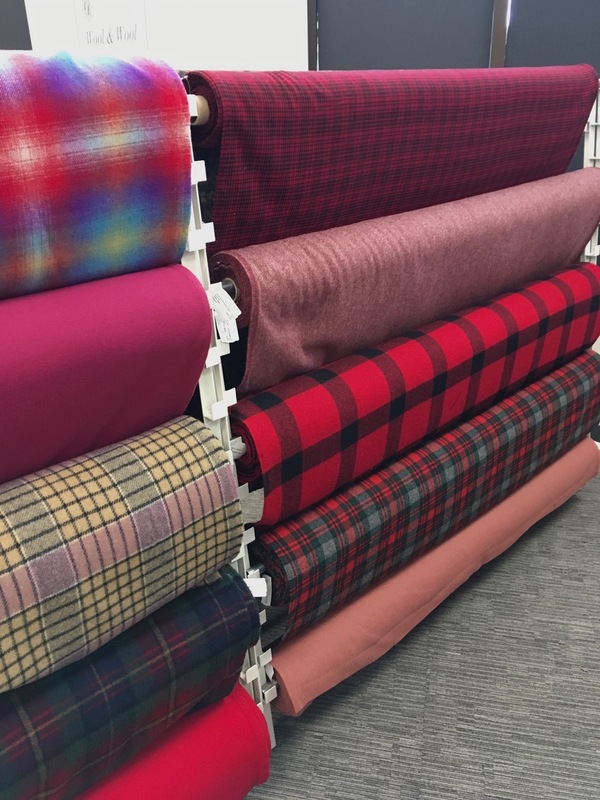 I haven't seen this much wool yardage in decades. Wouldn't this make a cute throw for the sofa? 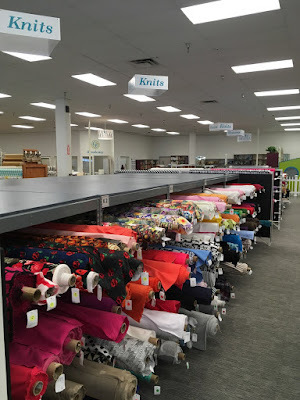 The center of the store housed the notions section - zippers, buttons, fasteners, webbing, thread, scissors, trims, etc. One end of the building had a classroom with sewing machines and tables. Near the quilting fabric section was a room with two or three longarm quilting machines. 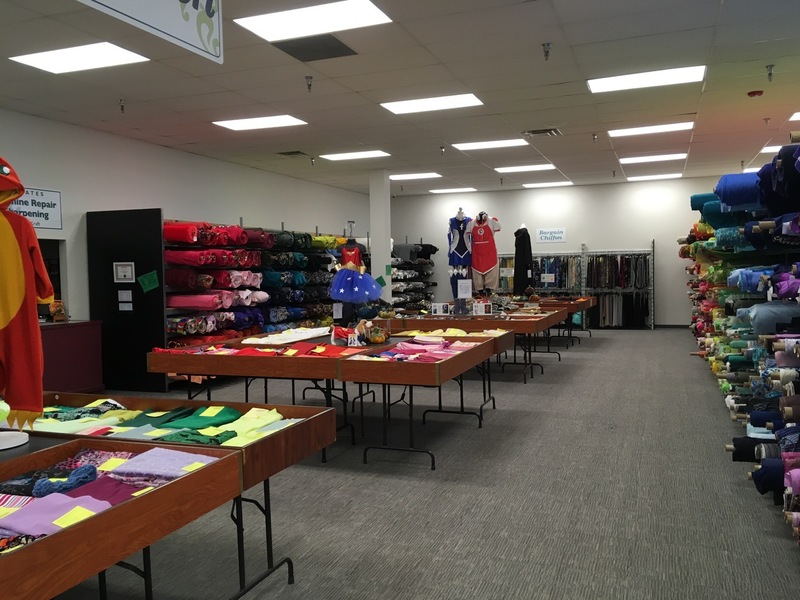 They do not have an online store, but one of the clerks said they will send small swatches of fabrics, if someone has a specific request. If I were a serious seamstress or needed a specific fabric or notion, this store would be on my radar. 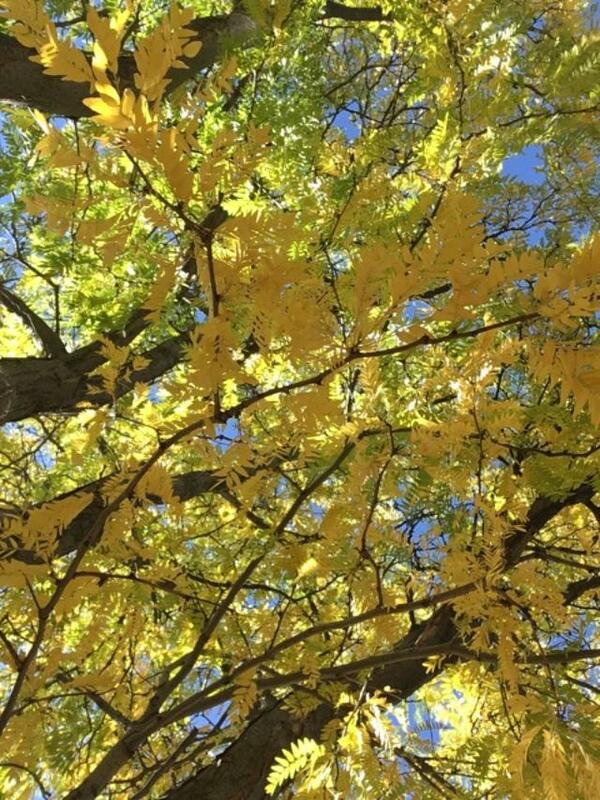 This photo was taken from the ground looking up to the sky, and I love the change of perspective. 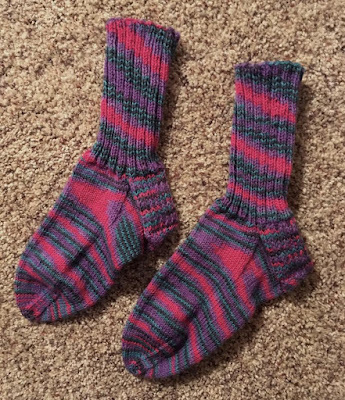 I started knitting this pair before I went to Colorado (the cuffs, heel flaps, and gussets were finished), and I completed the foot and toe sections before the road trip to Durango. Even though the sock on the right looks larger, it is the same size as the sock on the left. Dee and Vera gave me the nudge I needed to revive my sock knitting mojo. Since beginning the I ♥ Fall Knit-Along on October 1st, I've knit four pair of socks and have two more pair on the needles. Most of the leaves fell from my Ash trees while I was in Colorado, and the young man who winterized my sprinkling system offered to rake the leaves (for free) because he wanted them for his dairy goats to munch. I gladly accepted his offer. 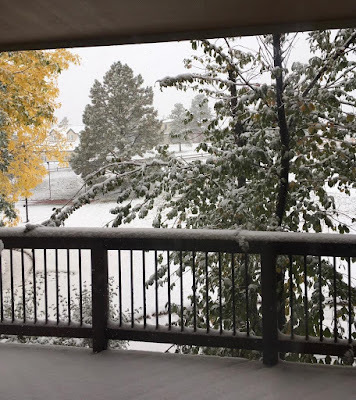 Saturday was a dreary and snowy day with no real accumulation because the ground is still warm, but soon that will change. I love living in an area that has distinct seasons even though they do not always occur in a typical or predictable order. I learned about the Afghan Knitting Project to benefit families of students who are being sponsored by Project Amigo from Jeni V. (fiber guild member) and used wool scraps that another guild member (Katheryn E.) gave me for charity knitting. 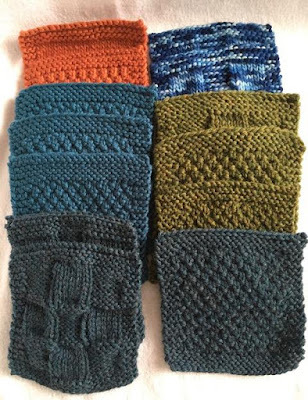 The project accepts both 5 inch or 6 inch squares (knit or crochet). 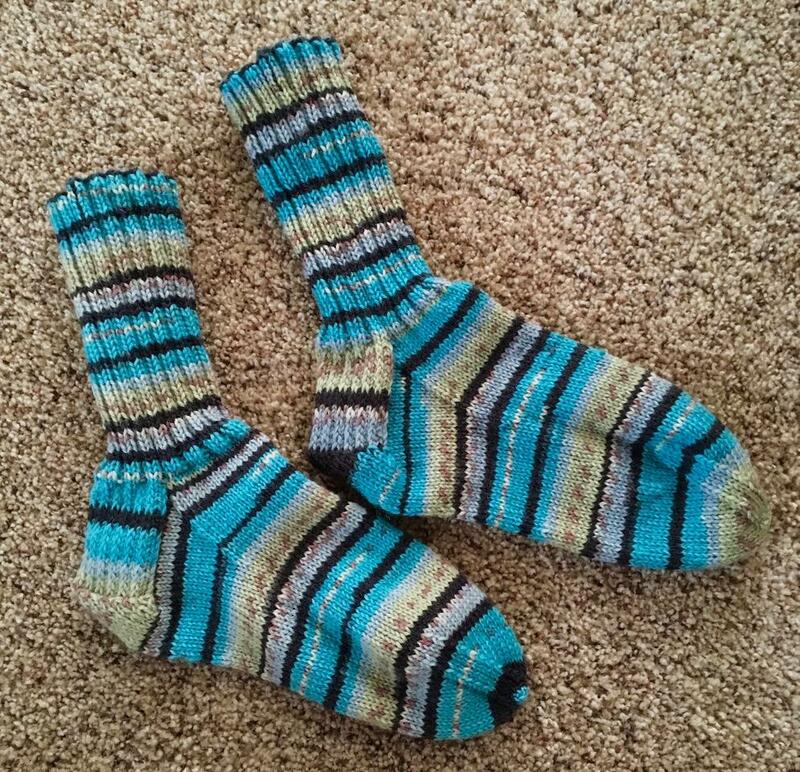 I chose to knit 5 inch squares from Katheryn's wool. Some of the yarn that Ellen sent me will be used to knit more squares for the Afghan Knitting Project. 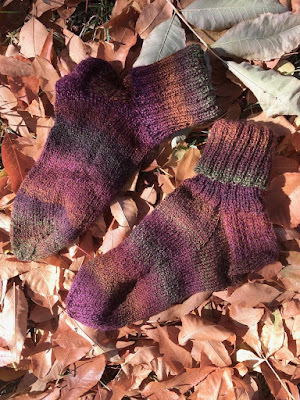 I finished the second sock at Marilyn's house on a snowy Monday afternoon, and two days later snapped the photo on the leaves that dropped off after the storm. 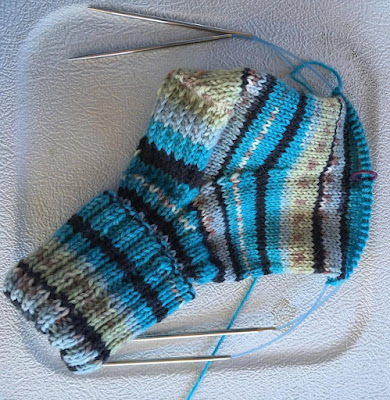 Knitting notes can be found here, here, and here. blocks and fabric donated by Pat S.
Pat S. from Virginia sent me a quilt UFO (unfinished object) that is destined to become a Quilt of Valor. 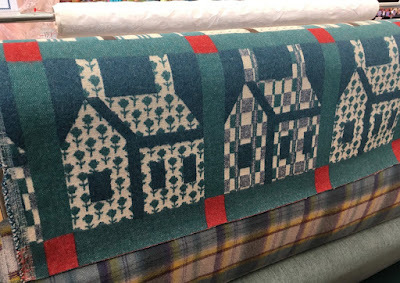 The blocks are paper-pieced and all finished. Two rows are sashed and sewn, but I need to remove the paper from the back, add sashing to the rest of the blocks and add a border or two (Pat included extra yardage) to meet the QOV size requirements. 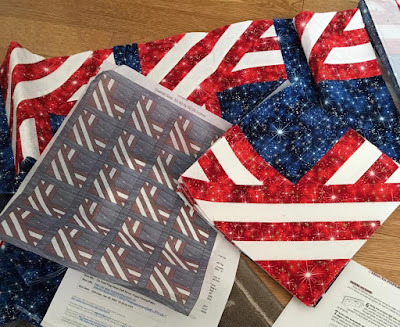 Thank you, Pat for allowing me to complete your project, which will bring comfort to a veteran. On Friday I picked up my accumulated mail at the post office and was surprised to find a package from Ellen (The Ellen Report). Tucked inside the box was a variety of worsted weight yarn (scraps and full skeins) and two skeins of sock yarn. 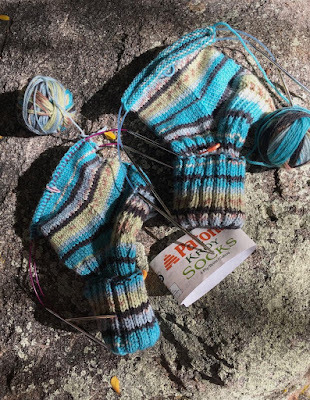 Ellen thought I could use the worsted weight yarn for charity knitting and included the sock weight as a special treat for me. The hank of brown and gold yarn (University of Wyoming colors) will be perfect for knitting a pair of Cowboy Joe socks! Knitting will commence very soon. Ellen, thank you for sending a box filled with fiber goodies. Your kindness is beyond measure. I managed to do a lot of knitting on the road trip. 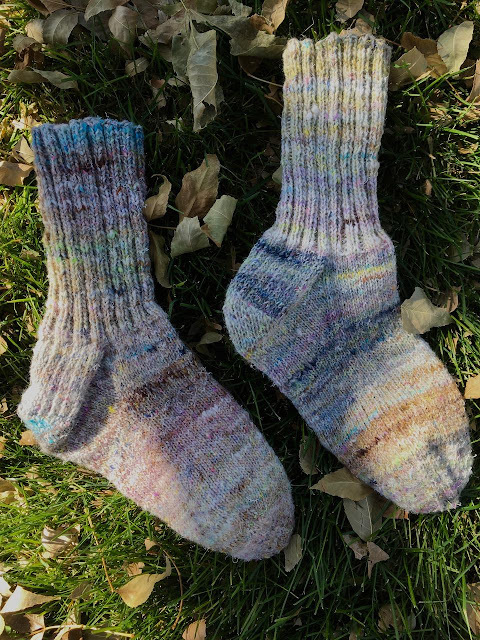 The cuffs of the socks were knit on the way to Durango, the heel flaps and heel turns were knit at the motel in the evenings, and the foot on the trip back to my sister's house. The weather was gorgeous on the trip, but we headed back a day early because snow was predicted and arrived on schedule. Monday was a good day to stay inside . 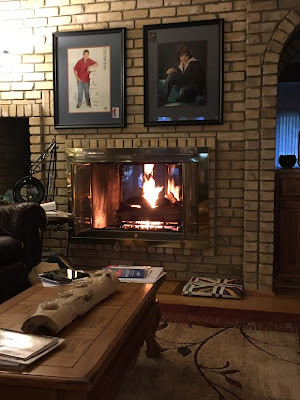 . .
in front of the fire . 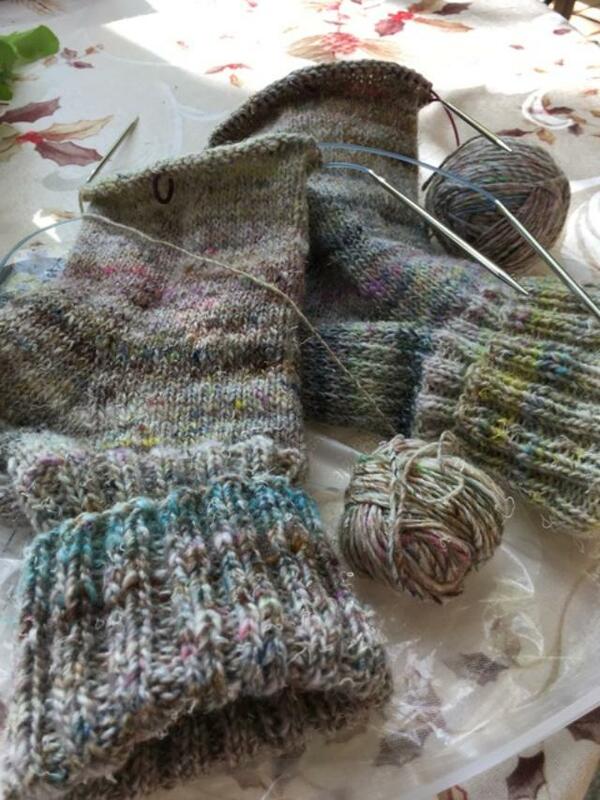 . .
and finish knitting Marilyn's socks. 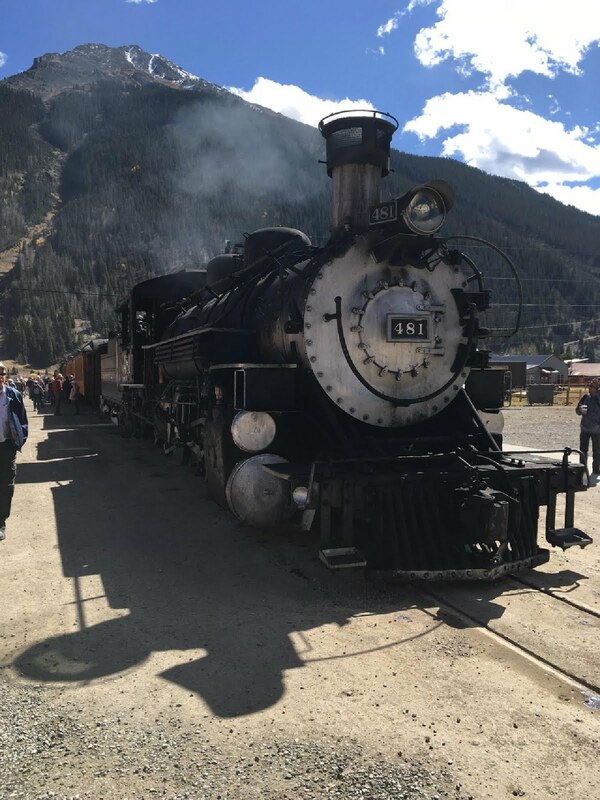 Last Friday, my sister, my brother-in-law, and I boarded a narrow gauge, steam train for a forty-five mile trip from Durango, CO to Silverton, CO. The scenery was gorgeous. 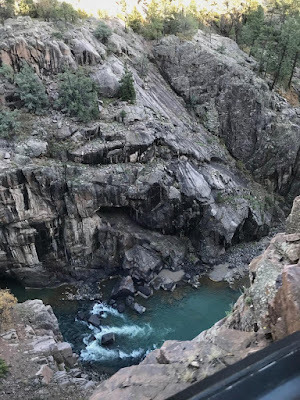 The Brakeman warned the passengers at the beginning of the trip to be watchful of what was ahead as sometimes the rock walls were close to the train. We discovered that they were indeed close. The train stopped twice on the way to Silverton to replenish the engine's water supply. Near the summit is a deep gorge (this photo does not begin to show the depth) and the track was mere inches away for the edge of the abyss. 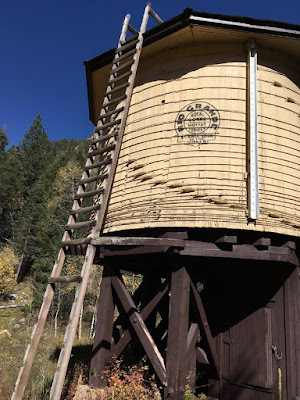 The 45 mile ride from Durango to Silverton was nearly four hours. 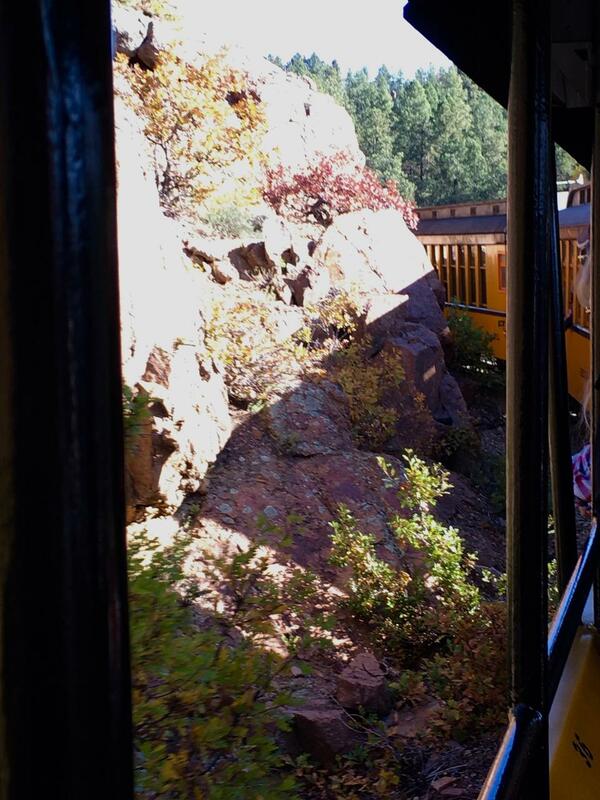 Some passengers opted to ride a bus back to Durango, but we purchased round-trip tickets on the train. 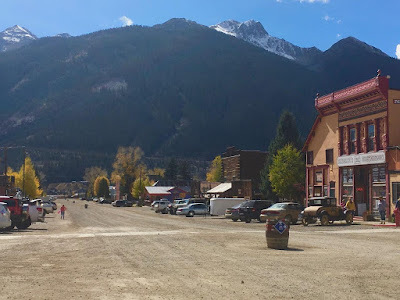 We ate lunch in Silverton and reboarded the train for the four-hour ride back to Durango. 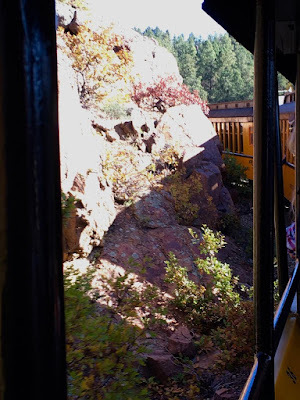 It was a fun and memorable day on the vintage narrow gauge train.